A Dickson grating works well over a narrow bandwidth of 20 to 60 nm but falls off quickly with wider bandwidths. It caused a lot of excitement for applications in Dense Wavelength Division Multiplexing (DWDM), Raman spectroscopy and Optical Coherence Tomography (OCT). DWDM applications benefit from the Dickson design since the bandwidth is typically 50 nm or less. 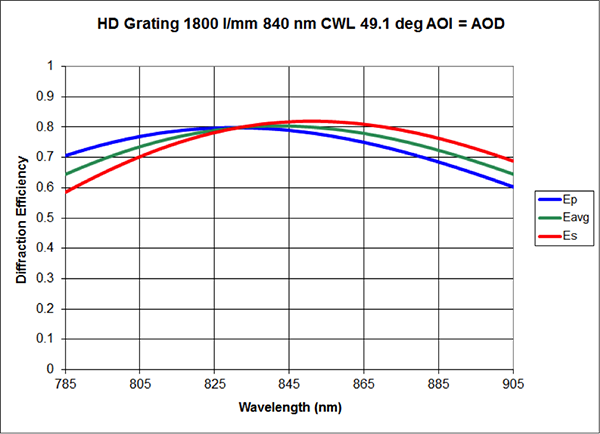 However Raman spectroscopy and OCT want more photons at the ends of their bandwidth of 100 to 200 nm. To meet this need, we developed the HD grating. The HD grating is a multiplexed grating. It has lower peak efficiency than a Dickson grating. However, it has flatter curve and gets more photons at the ends of the desired bandwidth as seen in figure below. This grating changes the way Raman spectrometers and OCT spectrometers are designed. It gets more photons for Raman spectroscopy and allows OCT spectrometers to run faster in a smaller compact design.